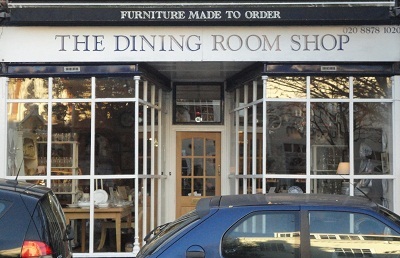 The Dining Room Shop has been a fixture of White Hart Lane Barnes for the last 27 years. When Kate Dyson's family demands caused her to give up her work as an antiques' journalist and founder editor of A World of Interiors, it made sense for her to open a business using her skills and experience. The shop does exactly what it says on the tin (or the sign above the door). Kate specialises in offering customers everything they could possibly need to furnish and accessorise their dining rooms or eating spaces. With the economy as it is we may not eat out as frequently as we would like, but it is far cheaper to entertain our friends at home, whether or not we prepare all the food from scratch, or cheat with ready meals from M&S. 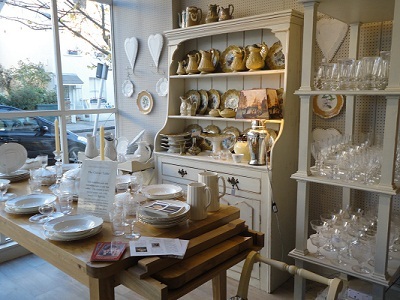 Kate is able to supply both antique and bespoke dining furniture as well as tables, dressers and sideboards. The wood can be left natural or painted, and designed in a range of styles, rustic, elegant or traditional. If you would like antique furniture that is not available in the shop it can also be sourced for you. 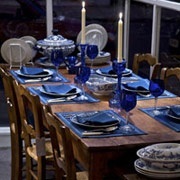 In addition she sells all the important items that help to personalise your dining space. 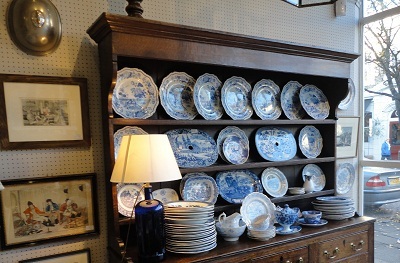 You can choose from beautiful china, lots of it in the traditional blue and white colours that we love so well in this country, silverware and silver plate, cutlery, glassware and table napkins. 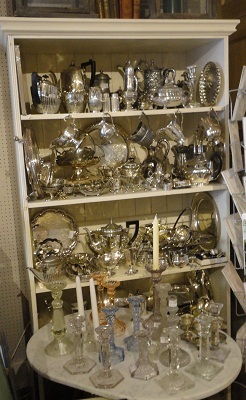 Many of these pieces are antiques, but there are contemporary ranges available too. In addition to the furniture you can find a huge range of pictures and prints to adorn the walls, as well as lampshades, light fittings, chandeliers and candlesticks to provide your room with a little more ambience and atmosphere. The popularity of Downton Abbey has possibly reminded us of the bygone formality of dressing for dinner. Most of us can't run to an army of domestic staff, and we rarely dress formally when dining, but there is very little that is more tempting than an exquisitely laid table with the light bouncing off the wine glasses and a glow created by flickering candles. I love to gather friends round my own Victorian mahogany table; a friend once took me outside to look in through the window to see how atmospheric the room appeared. Why not try it yourself?